Peter Forbes’ Convergence: A story of people, place and opportunity at Carr Lake looks at the beginning stages of a monumental, long-term project for Big Sur Land Trust. Peter – a respected leader working at the intersection of land, people, and communities – candidly captures diverse perspectives as we step out of our comfort zone and begin a journey with partners and community members to transform our first urban project in Salinas, California. In January 2017, the Ikeda family chose to sell their 73-acre farm to Big Sur Land Trust. 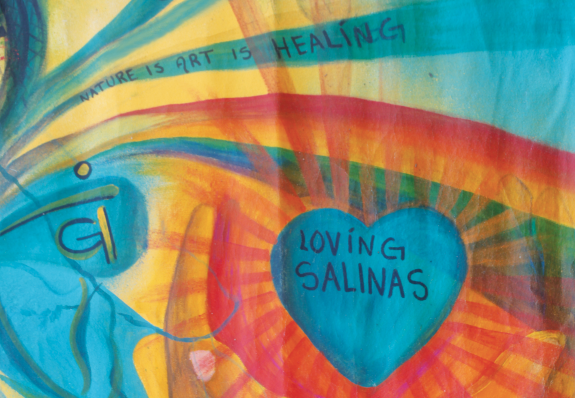 Since the 1920s, four generations of Ikedas watched Salinas grow, surrounding their property at Carr Lake. Since the 1960s, community members have been hoping to reclaim this farmland and make a park in the heart of the city. Collaborating with community leaders and residents, Big Sur Land Trust is – literally and figuratively – planting this long-time dream at Carr Lake. Convergence takes a detailed look at this dream and the needs that drive it, through the lens of City and community leaders, long-time residents, farming families, farm workers, and community organizers. The story also weaves in the diverse cultural perspectives and experiences of Native people, Latinos, Japanese, Whites and others. Our project at Carr Lake is still in its infancy. As I write this, the community is in the process of expressing their ideas. By early 2019, using natural, hydrological, and ecological priorities to frame what is possible at the site, the community’s ideas will be transformed into a draft design. At least a few more years will pass before the dream of a park that reflects the heart and soul of Salinas becomes a reality. Big Sur Land Trust will continue to learn as we embrace the beginning of a new era in land conservation – an era that strives toward an inclusive answer to the question: “For whom are we conserving these lands?” Convergence documents what we are learning and the way in which we are trying to answer this question for our Carr Lake project. As we listen and respond to the community’s vision, we recognize that we are in the earliest stages of this work and we will not live up to everyone’s expectations. As diligent as we may be, we will make mistakes along the way. We will continue to look for patience and guidance from partners and residents as we strive to do the best thing for the people and for the land. We want to thank Susan Kendall Newman for funding Convergence through Newman’s Own Foundation Community Partner’s Program. We also thank the people who shared their insights. Our gratitude goes out to Peter Forbes for using his incredible talent to tell this story. Now, we invite you to settle in and read this compelling piece about a community coming together to create a renewed, healthy open space in the heart of the city they call home.